There is huge uncertainty in terms of how climate change may affect health human (IPCC 2014), and this PhD provides an opportunity to explore one exciting area, namely how climate change may affect waterborne disease. It will focus upon Vibrios, which are Gram negative bacteria that grow in marine and estuarine environments. They thrive in warm, low salinity waters and infect individuals through open wounds leading to serious infections which may be fatal. Current climate warming is believed to be behind the significant increase in vibrio infections, especially in Europe. As such, vibrios are considered the pathogen group in Europe of greatest concern because of climate change (Baker-Austin et al., 2012). Rising sea temperature and vibrios are identified as a future risk for UK populations (Lake, 2016). However, a fundamental unknown is how their abundance and the incidence of vibrio infections will change as a consequence of climate change. This PhD project will gather relevant climatic, epidemiological and oceanographic data, to develop a clear understanding of the role of climate warming on the expansion of these pathogens. 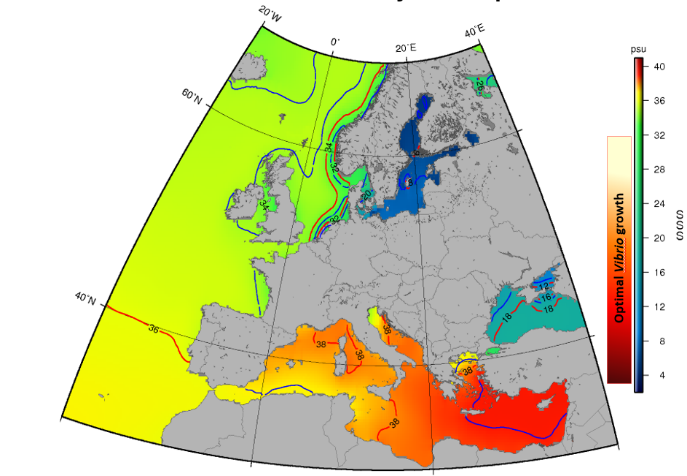 Sea salinity across Europe. Low salinity in the Baltic and Eastern North Sea region represent the regions where most Vibrio infections are reported. 1. You will gather health datasets gathered by European disease surveillance centres and combine these with relevant climate data such as sea surface temperature and salinity to develop an understanding of the influence of environmental factors upon human health (i.e. vibrio infections). These outputs will be used to inform our real-time risk assessments. You will apply the relationships uncovered in (1) to a number of regional climate models, for different levels of climate change, to generate future projections for vibrios and human illnesses in European waters. Finally, you will model a number of future scenarios for vibrios taking into account likely population change, trends in the recreational use of coastal waters and possible intervention strategies to minimize the risk of infections. You will be trained in the use of R for the analysis of large climate, environmental and health data sets and also in statistics. Training in systematic reviews, GIS and epidemiological analysis will also be provided. You will the opportunity to interact with an international group of experts and with policymakers in the climate change and health area, particularly through CEFAS and the ECDC. As a minimum you should have a good first degree (2:1 or higher) in science, geography or a related subject, but most of all have an interest how climate change may affect human health. Baker-Austin, C. et al. (2012). Emerging Vibrio risk at high latitudes in response to ocean warming. Nat. Clim. Change 3(1), 73-77 (DOI: 10.1038/nclimate1628). Lake, I.R. (2015). Food-borne disease and contamination. In S. Kovats (eds.) (2015) Health Climate Change Impacts Summary Report Cared, Living with Environmental Change. Baker-Austin, C., J. A. Trinanes, S. Salmenlinna, M. Löfdahl, A. Siitonen and J. Martinez-Urtaza. (2016). Heatwave-associated vibriosis in Sweden and Finland, 2014. In press, Emerg. Infect. Dis. Vezzulli, L., et al. (2016). Climate influence on Vibrio and associated human diseases during the past half-century in the coastal North Atlantic. PNAS, 1609157113v1-201609157. IPCC (2014). Human health: impacts, adaptation, and co-benefits. . In: Climate Change 2014: Impacts, Adaptation, and Vulnerability Part A: Global and Sectoral Aspects Contribution of Working Group II to the Fifth Assessment Report of the Intergovernmental Panel on Climate Change.